I had heard a LOT about Hen of the Wood, and all of it was good. So, of course when we were on the east coast for a wedding, and staying in Burlington, we had to check it out. The Burlington location is the second with the first being in Waterbury, not too far from the Ben & Jerry’s HQ (which we also visited – more on that in the next post). First off, let me tell you I am glad we stopped in while walking around town and made a reservation because the place was packed from the time we arrived until the time we left. Always a good sign! And making the reservation was more difficult than I had anticipated. The time and date we wanted weren’t available and we had to go a different night at a much later than usual dining hour for the Hubs, but it was so worth it. Secondly, don’t get your heart set on ANYTHING that you see on posted menus, or in this write up, and don’t ask for the daily specials – everything on the Hen of the Wood menu is a “daily special”. The menu changes each day based on what is fresh, local and available that day. They source as much locally as possible and work with what’s available. On the bottom of the menu there is a note about which farms provided the produce. Of course we looked at the menu online and made some preliminary selections and when we got there, none of the items we wanted to try were available. It was a happy accident that allowed us to try things that weren’t on our radar. The only thing that was the same were the Parker House rolls that we devoured! They were light, fluffy and topped with just a bare sprinkling of salt served with a savory compound butter. And I wish I had asked to take the dated, printed menu of the day. Thirdly, while it was just the two of us, after a quick trip the ladies’ room, I wished we had a crowd with us. I suggest you go with a group of 6 or 8 and make a reservation well in advance for the “Chef’s Table” by the kitchen. It is literally IN the kitchen at Hen of the Wood. That is how I like to eat; watching and seeing everything that is going on. And do be sure to check out the funky cool artwork (the WuTang Clan print was my fave) and the meat aging locker on your way to the restrooms. Now let’s talk about the food. For the first time in my memory, I voluntarily ordered a vegetarian dish and I was THRILLED that I did! Of all of the dishes we ordered, there was only one misstep, and it was more a preference than a poorly executed dish. We started with the Mushroom Toast. On the menu it didn’t sound like anything special, but the table next to us had it delivered and it looked so good that we ordered it as well. 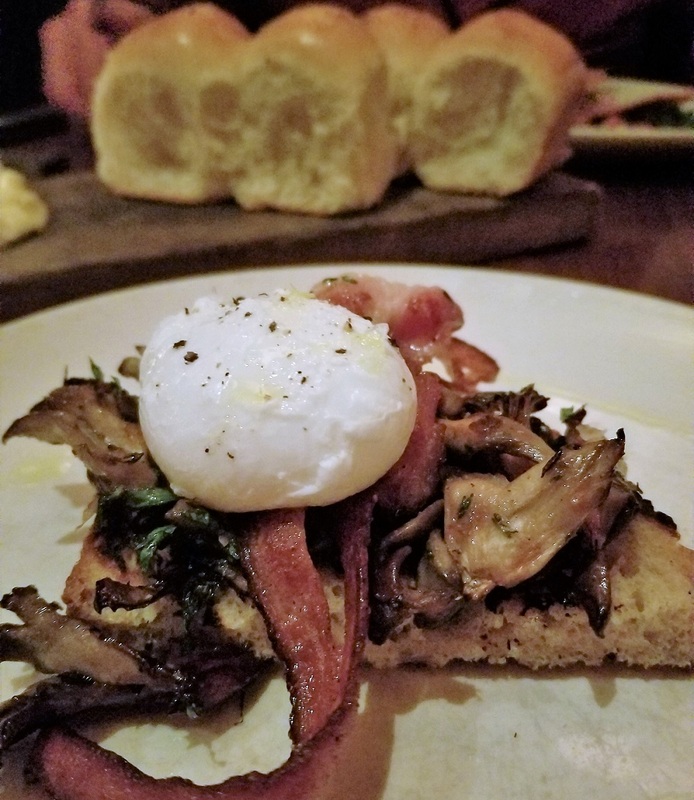 Thick cut, freshly grilled bread topped with beautiful seasonal mushrooms, bitter greens, pork belly and a gorgeous, perfectly poached egg. It was simply stunning and absolutely delicious, and I was left wanting more of them. I will be creating my own riff on this at home in the future. Then we moved on to the Beef Tartare with caraway crackers – this was the only dish we were not in love with. It was almost like a kitschy play on words between tartare and tartar. 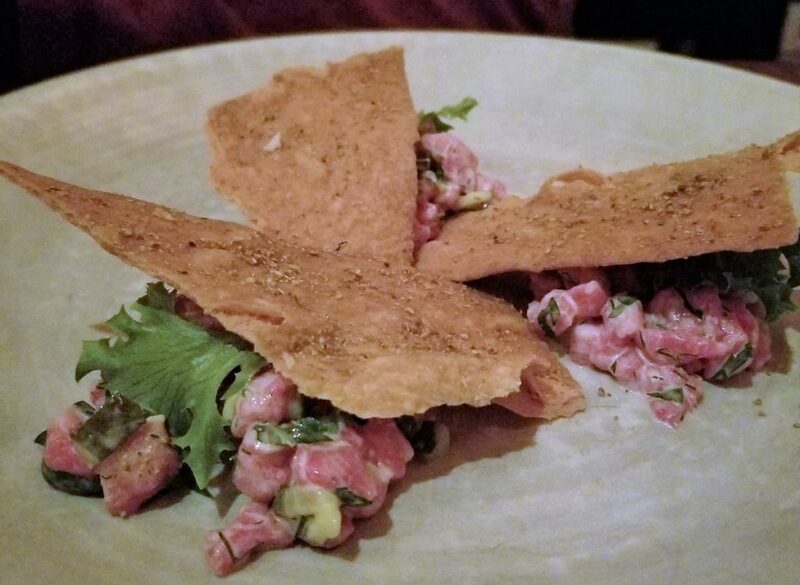 Tartare is one of my most favorite dishes to enjoy anywhere, and this one disappointed. There was a dill and mayo dressing along with nicely diced, crunchy vegetables mixed into the diced beef. It was beautifully executed, just not to our taste. Surprisingly, even though I despise caraway, I didn’t hate the crackers. They were crunchy, house made crackers with just a hint of caraway, not the overwhelming flavor I usually find with that seed. Next up was the Halibut with Fresh Corn. 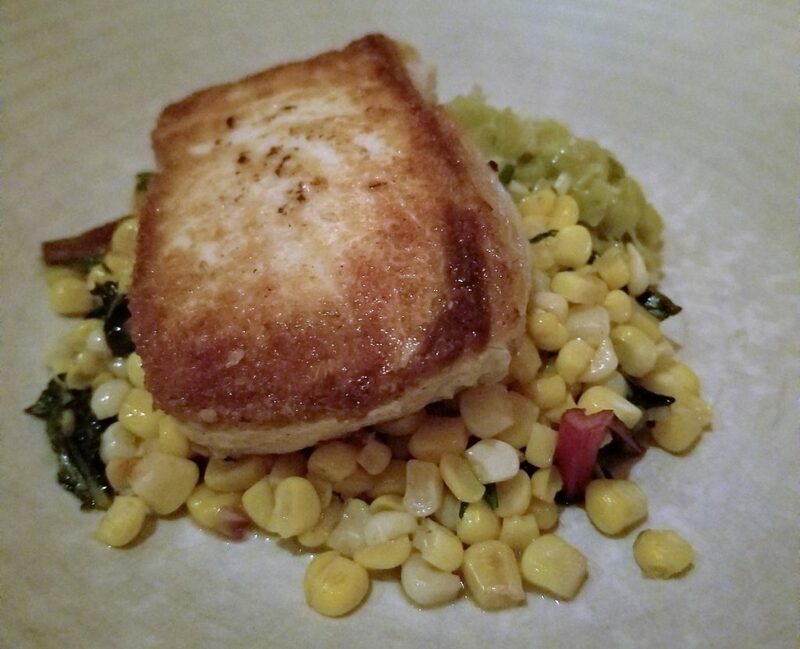 Again, a simple and beautifully plated dish of pan roasted halibut on a bed of fresh corn and a dollop of a zippy little green relish (not pickles…and this is why I wish I had asked for the menu, because I can’t remember everything). The crust on the halibut was crispy, the meat moist and flavorful, and the corn…holy hell was it was fresh and good. This is the kind of dish where Hen of the Wood really excels and highlights the freshest of flavors. The relish added just the right amount of acid to cut through the richness of the fish. Each component was perfect on its own, but when combined into the “perfect bite”, the way chefs intend, it was a masterpiece. By far, my favorite dish of the night was the vegetarian dish that I selected! I am as surprised as you are…trust me! 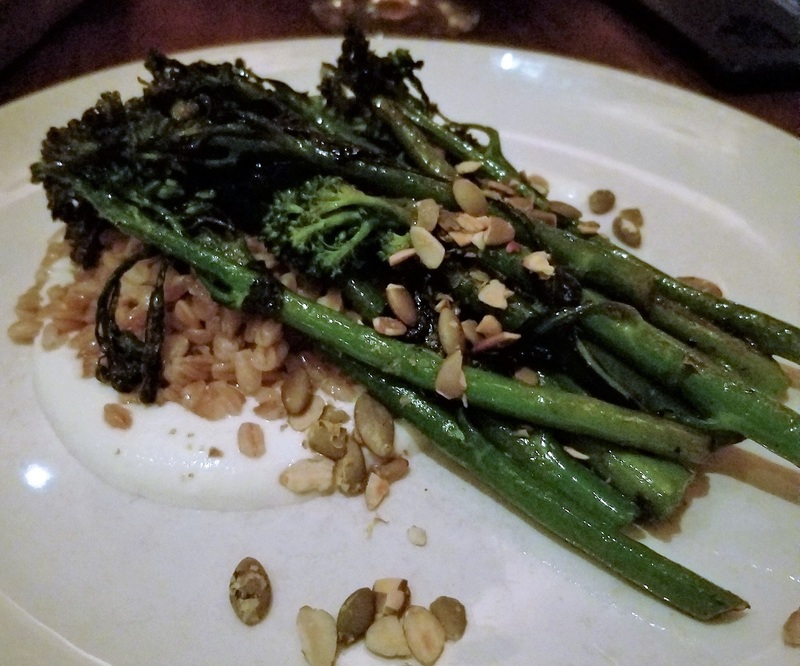 Broccolini with Farrow and Whipped Ricotta. The ricotta is, of course, made in house and served as the perfect sweet foil to the bitterness of the broccolini. And the sprinkling of pepitas lent the perfect additional crunch to the dish. Farrow is one of my favorite grains to play with, partly because of the texture, and this also will be riffed on in my kitchen. We skipped dessert because the Hubs wanted soft serve, excuse me – a creamee – from the local stand down the street (more on that in my next post too). But we did consider a cheese plate since there were so many fabulous offerings on the daily sheet. On the whole, if you are planning a trip to Burlington – call ahead and reserve a spot at Hen of the Wood. You won’t be disappointed. I suggest you follow along on Instagram, Facebook or Twitter so you don’t miss any pics and of course SUBSCRIBE so you don’t miss any postings. I don’t share your info and you will only hear from me once a week, Tuesday evening at 8 pm Pacific time, and ONLY if there is new or updated content here.